Members of Kingdom Fungi include edible and poisonous mushrooms, molds that flavor cheeses, yeast that leavens breads, medicines such as penicillin and organisms that cause human disease. Although they appear much like plants, fungi cannot make their own food; instead, they feed on dead organisms or act as parasites. Fungi first digest their food outside of their bodies before ingesting. Some fungi species comprise two forms: a yeast form enclosed in capsules at room temperature and a mold form made of threadlike structures at body temperatures. Drugs that treat fungal infections disrupt important functions in the fungal cell, such as cell-wall production. Molds form in humid environments. They consist of visible portions called stalks, threadlike appendages anchoring the mold, and spores that cling to the stalk. The spores, the reproductive structures of the mold, become airborne. The spores, when inhaled, cause breathing problems and trigger allergies. Some molds produce poisons, or mycotoxins, such as aflatoxin, a cancer-causing agent. Molds form on foods and cling to refrigerator interiors and cleaning implements. To keep exposure to mold at a minimum, cover and refrigerate food immediately, consume leftovers within a few days and avoid inhaling moldy items. 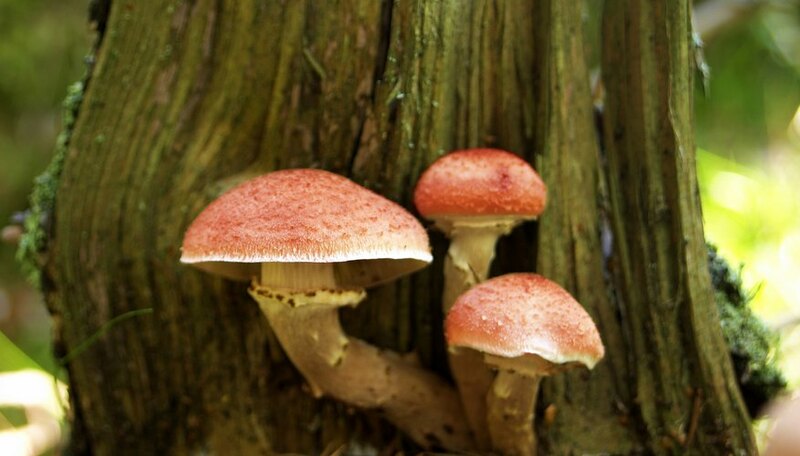 Certain poisonous mushrooms closely resemble edible ones and may deceive the amateur mushroom collector, delivering almost certain death if you ingest even a minute amount. 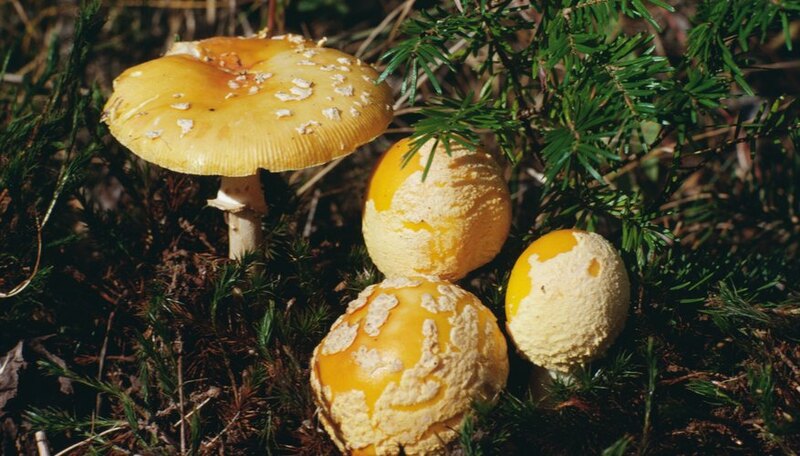 Mushrooms of the Amanita group such as the destroying angel and death cap have no antidote, causing death from liver and kidney failure. The false morels bear a remarkable resemblance to the edible true morels, but false morels upset the digestive system and occasionally result in death. Other harmful mushroom species may cause only gastrointestinal upset or produce hallucinations. Fungi can infiltrate the external layers of human bodies and cause itching and rashes. Several common, treatable fungal conditions afflict human skin, hair and nails. Ringworm caused by several Tinea species may affect the head, trunk and extremities; athlete’s foot occurs as a ringworm of the foot. Black piedra causes dark bumps to form on the hair shaft. Fungal infections of the toenails, or onychomycosis, stem from foot infections. These fungal infections spread from an infected object or person. Keeping body parts dry and cool helps prevent superficial fungal infections. Four fungal species -- Coccidioides immitis, Histoplasma capsulatum, Paracoccidioides brasiliensis and Blastomyces dermatitidis -- characteristically produce spores that lead to systemic mycoses, fungal infections that affect more than one part of the body. In healthy individuals, the infection either produces no symptoms or clears up on its own. In people with compromised immune systems and the very young or very old, inhalation of fungal spores produces widespread illness in several organs at once and may cause death. Treatment typically includes antifungal medication, amphotericin B. More than 8,000 species of fungi infect plants, making fungi the most prevalent plant pathogens, or disease-causing organisms. These parasitic species render fruit and vegetables inedible, yellow leaves and sometimes kill the entire plant. Fungal diseases of plants lead to economic losses for the agricultural industry and shortages in plant food sources for human and animal consumption, affecting plants before or after they're harvested. By genetically altering the susceptibility of plants to fungal disease, using fungicides and isolating infected plants, botanists hope to ameliorate the effects of fungal diseases. American Academy of Dermatology; Tinea (Dermatophyte) Infections; Julian Trevino, et al. Dinh, Ho-Diep. "The Disadvantages of Fungi." Sciencing, https://sciencing.com/disadvantages-fungi-8714000.html. 25 April 2017.